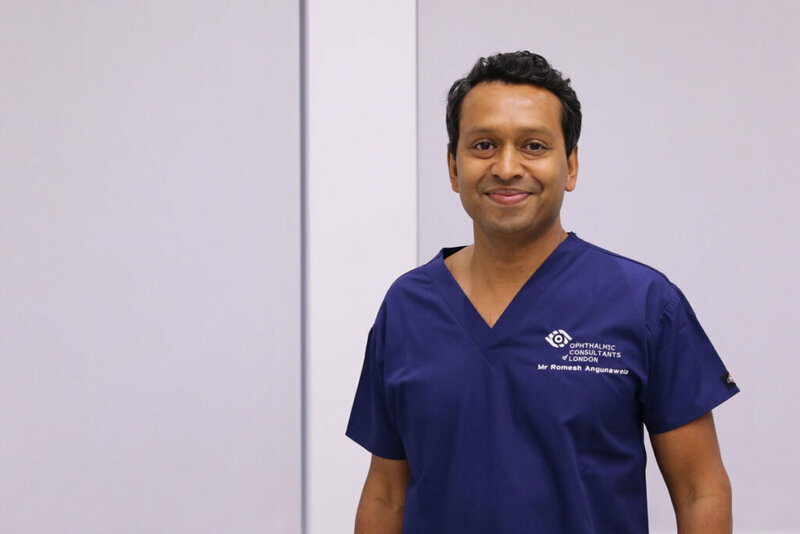 Mr Romesh Angunawela BM, MD, FRCOphth, FRCS, Cert LRS is a consultant eye surgeon at Moorfields Eye Hospital where he is a specialist in laser eye surgery, cataract & lens replacement surgery and corneal transplant. He is Director for corneal training at Moorfields Eye Hospital and Clinical Lead for the Moorfields Lions Eye Bank. 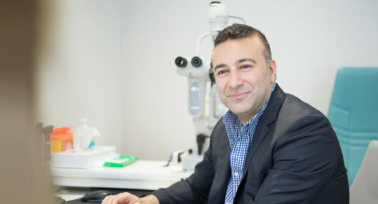 He graduated from Southampton Medical School in 1997 and has been a doctor for over 20 years, working in neurosurgery and maxillofacial surgery before specialising in ophthalmic surgery for the last 18 years. Mr Angunawela was awarded a doctorate (MD) from the University of London for his research under the supervision of Professor John Marshall OBE, a founding father of modern laser eye surgery. He completed his clinical training at St Thomas’ Hospital and Moorfields Hospital in London following which he completed two and a half years of specialist fellowship training in cornea and lens surgery at Moorfields Eye Hospital and with Professor Donald Tan and Professor Jodhbir Mehta at the Singapore National Eye Centre. He holds the Certificate in Laser Refractive Surgery (Cert LRS) and Fellowship of the Royal College of Ophthalmologists, and is also a Fellow of the Royal College of Surgeons of Edinburgh. Romesh Angunawela has appeared in national top 10 surgeon lists for cataract surgery and laser eye surgery in the UK. He has won a multitude of national and international awards and is considered an expert in the fields of cataract and lens surgery, laser eye surgery and corneal transplant surgery. 2011 Best paper Zeiss Laser User Group meeting. 2007 Best video prize. ASCRS San Diego, USA. Awarded best paper by the United Kingdom and Ireland Society of Cataract and Refractive Surgeons (UKISCRS) or research into corneal wound healing after laser eye surgery. Best paper in refractive surgery by UKISCRS for comparison of wound healing after LASEK laser surgery and epi-LASIK. He has also published multiple research papers on the early development of the SMILE laser eye surgery technique. Awarded best paper by the United Kingdom and Ireland Society of Cataract and Refractive Surgeons (UKISCRS), the European Society of Cataract and Refractive Surgeons (ESCRS) and the American Academy of Ophthalmology (AAO) for his description of the fish tail technique for complex cataract surgery. Awarded best paper in refractive surgery by UKISCRS for research paper into corneal collagen crosslinking efficacy with contact lens masking. Mr Angunawela is also one of the first surgeons to perform Avedro Curv topography guided crosslinking. Romesh is not only an amazing surgeon but also an extremely nice person. He makes you feel so at ease and takes such care in explaining everything and calling you personally after surgery. Mr Angunawela’s team at Moorfields Eye Hospital were awarded the prestigious National Patient Safety Award in 2017 for their work in identifying complications arising from a common combination of medications used after cataract surgery. This triggered a national alert and prevention of harm action. A research paper arising from this work is in publication. The group were shortlisted for the same award in 2018 for their work in managing infection after corneal transplant. Romesh has published over 50 research papers and 2 book chapters. As a lecturer to medical students at St George’s, University of London, Romesh has received commendations for his teaching. 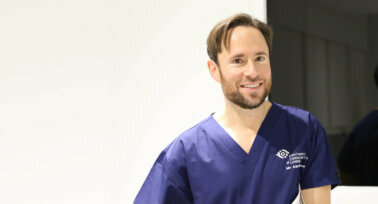 He is also faculty on the University College of London’s MSc program in ophthalmology. He teaches regularly on courses as part of the European Society of Cataract Surgeons, including highly rated courses on cataract surgery, DSAEK surgery for Fuchs’ dystrophy and complex lens exchange in cataract surgery. 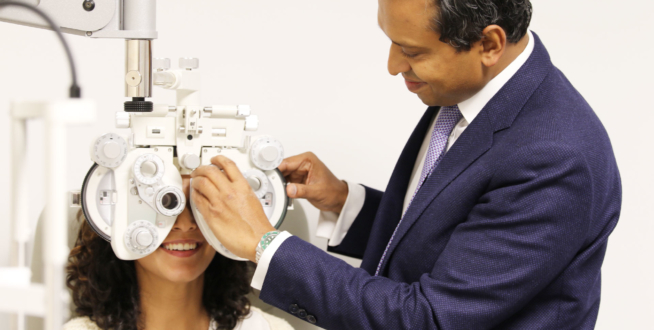 He is responsible as Director for the internationally renowned corneal fellowship program at Moorfields Eye Hospital and trains junior eye surgeons each year. Romesh has travelled to the Nubra Valley to treat people as part of the Himalayan Vision Project, which aims to bring modern health care to these remote communities as part of the Himalayan Health Project. He continues to support the charity.